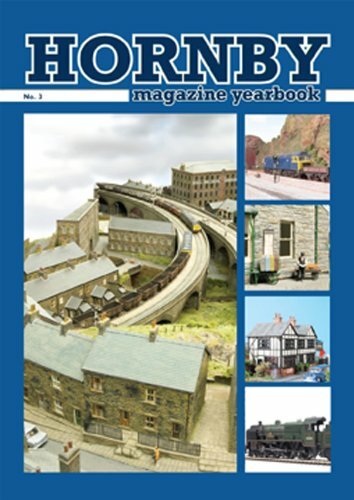 Hornby Magazine Yearbook No 3 featuring Dewsbury Midland, one of the best layouts on the exhibition circuit. The first two editions of the Hornby Magazine Yearbook, published November 2008 and 2009, were a huge success. Editor Mike Wild has once again followed this successful format. Hornby Magazine Yearbook No 3 is certain to take the modelling market by storm, and will be eagerly awaited by modellers nationwide. As well as Dewsbury Midland there is a very good selection of other layouts in both N and OO gauge to suit all interests with excellent photographs.There is a great article on detailing the Hornby 9F. Motive power surveys cover what has been issued by manufacturers during 2010and what is coming in 2011. Hornby Magazine Yearbook No 3 follows on with this successful blend of practical features for a wide range of modelling skills. Once again the yearbook is well illustrated and is packed full of high quality photographs, diagrams and plans for project layouts to illustrate the practical nature of many of the features. Mike Wild, editor of Hornby Magazine, has compiled a selection of new material to complement the magazine, making this an attractive end-of-year purchase for all modellers.Some material from the magazine is repeated, so if you didnt buy Hornby Magazine in 2010 here is your chance to catch up.